Do you have plans this Saturday? What’s not to love though, really? 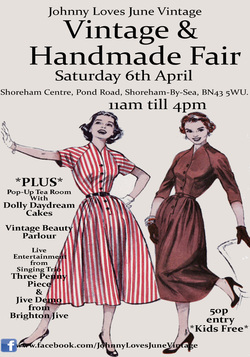 Then why not head down to Johnny Loves June’s Vintage and Handmade fair at The Shoreham Centre. It’s going to be awesome! Stallholders include my fabulous friends at Doris Loves, who will be dishing out temporary tattoos (in exchange for money) from their beautiful temporary tattoo station, and the lovely, adorable Sarah at Sitting Comfortably, the veritable Simon Pie-man of gorgeous homeware (but much more attractive, obvs). Throw live music, jive demonstrations, a pop up tea shop and… AND a vintage beauty parlour into the mix, and by jingo, you’ve got yourself a party! I am so excited, it’s almost obscene. Doors open at 11am, check out their site for full details. ← A Liebster Award… for me? I may cry.